For the season finale, we’ll travel up to the Zig Zag Road vineyard and winery and dwell upon the theme of family. Harriet Churchill has moved 20000 miles away from her parents, siblings and closest friends to become a wine maker, vineyard manager and mother. She’ll tell her story of what family means to her and how a yearning for family, and her drive to recreate family, plays a central role in her life. After the Service we will head to Small Holdings to celebrate the end of the season, and a year of Henry and Harriet’s wine making adventure. Zig Zag have partnered with the beautiful Small Holdings restaurant in Malmsbury for a wine tasting and tapas experience. To mark the occasion, Henry and Harriet will throw in a free glass of beautiful vino. The Weekly Service is a curated experience of storytelling, reflection, discussion, music and tea, designed to help us slow down and reconnect. Entry for the Service is: $20 General Admission I $15 Concession I Members of The Weekly Service come for free. 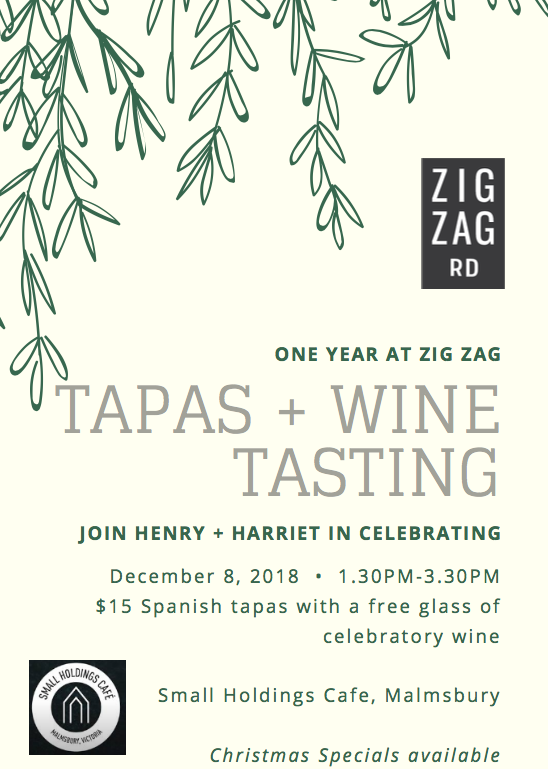 Zig Zag Celebration Tapas is $15.